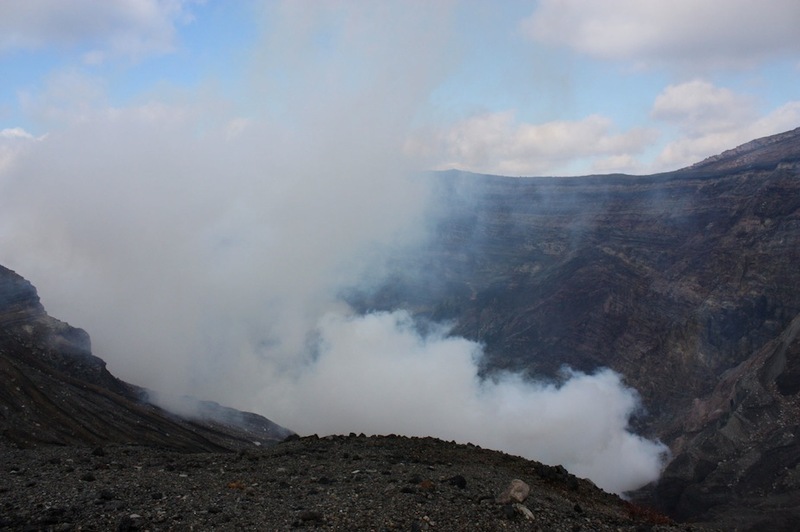 In the early afternoon of November 1st 2012, at an altitude of 1,258m, I stood by the crater of an active volcano, watching the sulphuric steam rise from its core with everlasting fury. The landscape was dry and barren, barely a living organism to be seen aside from the few tourists who gathered around two of the four viewing zones that were currently open. A deep turquoise lake made up the acidic centre of the crater, adding some vibrance to the otherwise monochrome panorama. The fragrance in the air was reminiscent of rotten eggs; every now and then a strong gust of wind would waft the noxious gases a little too close for comfort. A few times I had to mask my mouth with my shirt in order to filter out the pungent vapour and get a breath in. It’s completely understandable how they don’t recommend people suffering from asthma or bronchitis to visit the crater. I spent around 45 minutes exploring zones C and D, taking in as much of this eerie atmosphere as I possibly could. I stepped inside the concrete emergency shelters dotted around the complex, wondering if they really would offer any form of safety should an eruption occur. I made friends with some locals who struck a convincing pose against the bubbling lake in the background. I pondered the mountaintop shrine, presumably installed as spiritual protection from impending disaster. I laughed at the No Smoking sign that was ignored by the crater with all manner of blatancy. And I pinched myself at the realisation that a lifelong dream had been fulfilled.